Ziplining in Hawaii has become one of the most popular adventures for visitors of all ages. 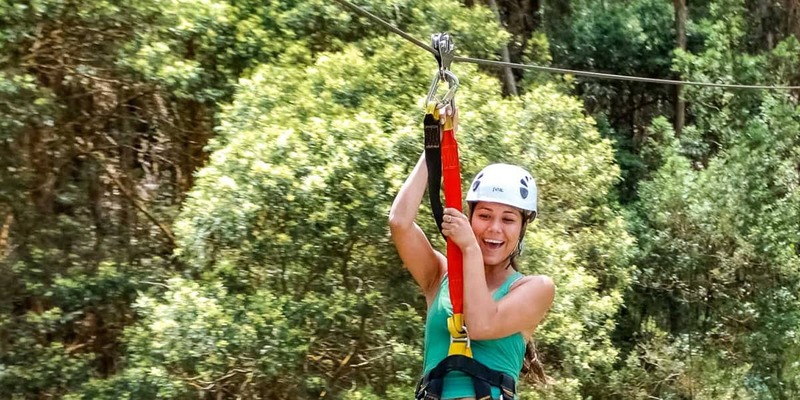 Weather flying from tree to tree on a canopy tour or zipping side by side over valleys and gulches with spectacular views, your sure to have a thrilling day with friends and family on a zipline tour! Zipline tours are set up along a course usually running from a higher to lower elevation. The zipline gear and techniques can vary from seated chairs facing forward with handle bars to harnesses that allow you to turn and steer yourself. Some courses have takeoff and landing ramps and some have braking systems ease you to a stop where you can be disconnected from the line by trained guides. 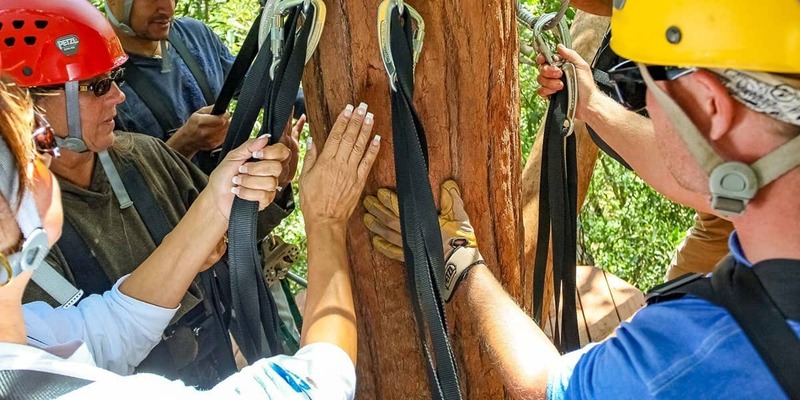 Since the first commercial zipline course in America was built in Hawaii in 2002 the state has some of the most experienced guides and companies in the country. Hawaii has become the perfect place to experience this thrilling adventure in a safe and comfortable tour. Let us help you find the perfect zipline adventure you’ll be talking about for years to come! Zipline courses are the latest adventure activity to experience during your Hawai’i vacation. The thrill of flying through the air on a zipline has become very popular and each island has an array of courses to choose from. Today visitors have lots of ways to enjoy this adrenalin junkies dream activity. From single line courses soaring through forests and across mountain slopes to tree to tree canopy tours to side by side zipping on dual lines, ziplining has grown to become a safe and fun activity for the whole family! We can help you sort out the different kinds of course, the types of zipline gear, take-off and landings required and locations. You’ll also get the best price available but be sure to book well in advance. These tours are so popular they are often sold out weeks in advance! Our amazing Treetop Canopy Zipline Tour begins at the top of Ka’a’awa Valley with 7 exciting tandem sections, 2 suspension bridges and 3 mini-hiking nature trails about 5 minutes in length. 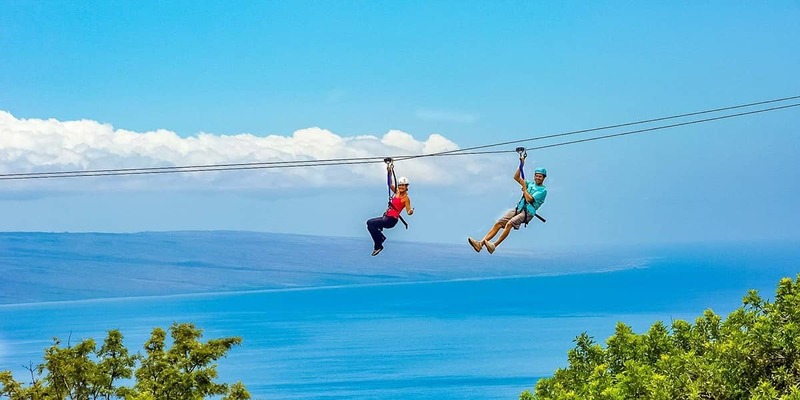 The first commercial zipline course in the United States was built on Maui in 2002. Today there are 8 zipline courses on the island. 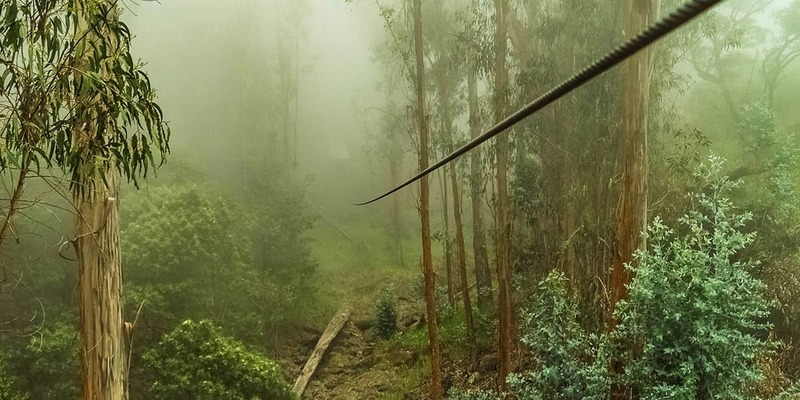 Though it may seem like the idea of zipping down a cable through the forests, jungles and mountain slopes is fairly new – its not. In fact ziplines have been in use for hundreds of years! They were used daily in ancient China to cross deep river valleys and streams. They are still in use today as a standard mode of transportation in some parts of China such as in the Hongdae Valley were children cross a 260 ft line over a 460 ft deep gorge every day to get to school. Partway through you’ll come to our newest feature, the thrilling “QUICKjump,” which gives the sensation of a “free fall” while lowering you to the ground 40 feet below. A zipline tour is a series of cables stretched between trees or poles in which participants are attached to the cable with a pulley that attaches to a climbing harness. Each line has a take-off ramp and a landing ramp. Multiple lines make up a “course”. Lines usually increase in length and speed as you progress down the course. Zipline tours usually involve some light hiking and stair climbing. All gear is provided but you must wear close-toed shoes and weigh between 80 and 250 pounds. Some zipline courses can accommodate lighter weight kids or a bit heavier people but not much more than 270 lbs. Can you take a camera on a zipline tour? You can take a small camera or phone but you cannot carry it in your hands while zipping. You’ll need both hands to control your descent. Having it around your neck will not help either (strangled visitors – not good!) Many tours have helmets with GoPro mounts for rental cameras. (or bring your own). Is there a difference between ziplining and canopy tours? Yes. 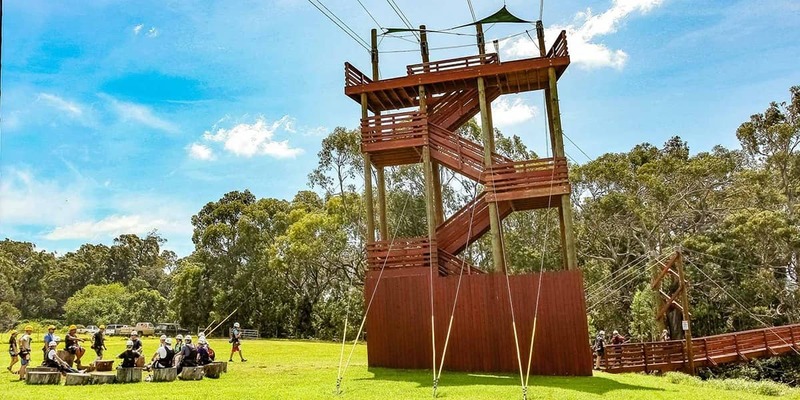 Ziplining tour starts from a ground-based platform (stairs) with the line leading to another land-based platform. Visitors then hike or walk to the next takeoff platform. A canopy tour starts in the trees (more stairs) and then goes from platform to platform in the trees off the ground. All ziplining tours have weight restrictions. The general rule for kids is you must be at least 7 years old and weigh at least 80 lbs. For adults you must weigh under 270 lbs. Some courses have been designed for smaller kids and heavier adults. Everyone must wear sturdy close toed shoes. There is often running takeoffs and landings. It is recommended that you be in moderately good health and physical condition. Ziplining often requires some hiking and the ability to stand on your feet for a few hours. Loose clothing and jewelry can be a problem on a zipline. Also if you have long hair it is recommended that you tie it back or wear a hat. Weather can change quickly in Hawaii at higher elevations and rain and wind can create some chilly conditions. Bring warm clothes or a light windbreaker. Some tours provide rain gear. Do not zipline if you: are pregnant, have existing or recurring injuries of the knees, back or legs or if you have any physical handicaps or disorders. Zipline gear consists of a climbing harness connected to a pulley with straps. Some harness and pulley combos allow you to turn freely while others hold you in a forward facing position. 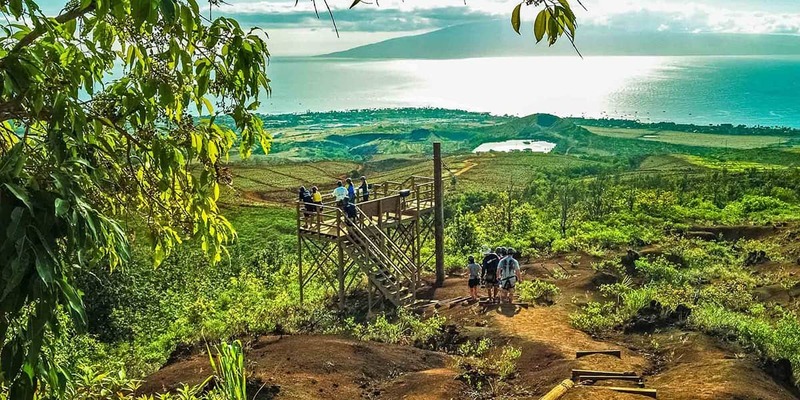 Most of Maui’s zipline courses are pure thrill rides but several mix in added attractions such as suspension bridges, hikes through unique ecosystems or even a zipline drop into a pond. On Haleakala visitors can see the sunrise at the summit, ride a bicycle down the volcano and then do a zipline course all on the same tour. 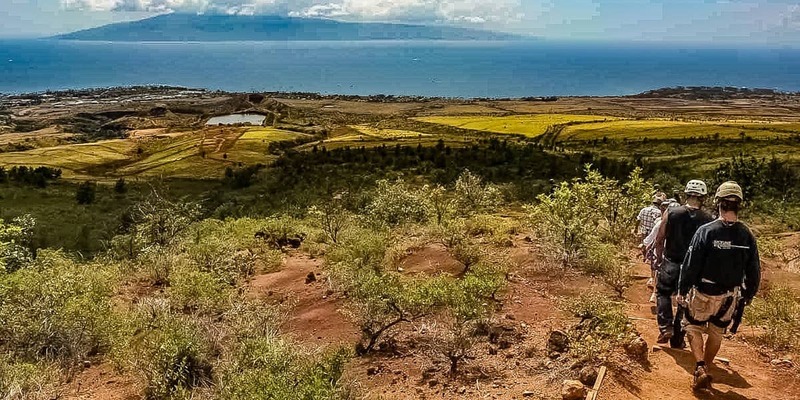 Several zipline courses on Maui where strung using helicopters. Ziplines use the same cables that are used to stop a 20,000 ton F-16 fighter jet on the deck of an aircraft carrier. Four of these 35mm thick steel cables are used to stop a jet fighter in 2 seconds! North Carolina has 24 commercial zipline courses, the most of any state. 72 countries on six continents have commercial ziplines. Ziplines are also known as zip wires, zippy’s, aerial runways or tyrolean traverses. In New Zealand and Australia ziplines are known as a “fly fox”. Ziplines first became popular in the modern era when they were used in the 1970’s by scientists as a way of studying rainforests with minimal impact to the environment. Costa Rica was one of the first countries to offer zipline tours in the 1970’s. Today there are many portable backyard ziplines across the U.S. and they have become fun entertainment for carnivals, fundraising events and parties of all types. In 2002 there were 10 zipline companies in the United States Today there are over 200. The 1992 movie “Medicine Man” starring Sean Connery spurned the interest in ziplines tours in America. The movie depicted ziplines used by scientists in the amazon rainforest. The fastest zipline in the world is Great Britain’s Velocity Zipline by Zipworld in North Wales. Riders are suspended in a head first “superman” pose while wearing a flying suit, helmet and goggles. Guests can reach speeds of 100 mph on this 1,400 ft high line!